Showered With Love is an initiative by Kelly Terrien, a local business owner and Veteran. She recently formed Showered With Love, Inc. a 501(c) 3 nonprofit. The idea of mobile hygiene is not a new one, but this is the first time it is being brought to Colorado Springs. The vision of Showered With Love is to provide people a sense of dignity and hope by providing access to basic hygiene services: soap, clean water, a safe toilet/shower facility, via a mobile trailer unit. The intention is to provide services to those individuals who lack access to toilets and to bathing regularly. Showered With Love provides people opportunities to take a shower, shave, brush their teeth, and use the restroom. The basics for self-care. Our goal is to purchase two trailers. One trailer, outfitted with 3 showers, sinks, and restrooms, will travel daily/weekly to participating support organization facilities. This trailer has been purchased and delivered. The second trailer will contain 8 showers and sinks and will be placed at a local non-profit agency site, allowing Showered With Love to provide services on a full time basis. All operations will be done in partnership with Showered With Love and a host organization. Showered With Love will not attend any event or outreach without the support of at least one partner organization. For example, every Tuesday the mobile hygiene trailer will be at West Side Cares from 10 a.m. – 1 p.m.; every Thursday the trailer will be located at Grace Church from 1 – 3 p.m., etc. During these times, basic hygiene services will be offered to the homeless community. Showered With Love volunteers are actively seeking donations to purchase the additional trailer, a truck to pull the 3 stall trailer, towels, hygiene products, cleaning supplies, other toiletries, and ongoing operational support. Showered With Love, Inc. (SWL) is the first mobile shower program to be launched in Colorado Springs to aid neighbors in need. On Wednesday, August 29th the first SWL shower trailer was parked outside Michelle’s Makery offering tours to the public. We're so grateful for the support, and for the positive messages from our community. If you want to know more about how you can help, visit our website at www.showeredwithlove.org! 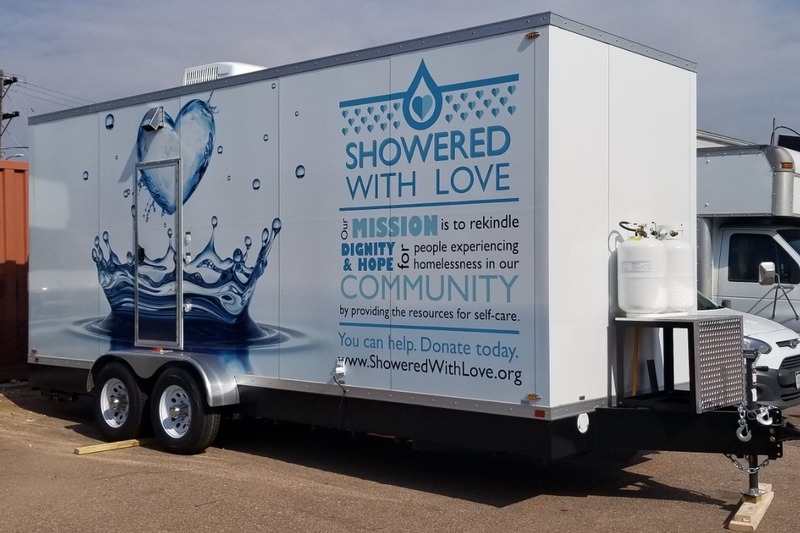 Colorado Springs, CO, August 28, 2018 – Showered With Love, Inc. (SWL) is a new nonprofit, and the first mobile shower program to be launched in Colorado Springs to aid neighbors in need. Wednesday, August 29th from 9am – 3:30pm, the first SWL shower trailer will be parked outside Michelle’s Makery (122 North Tejon St.) offering tours to the public. Media is invited for tours and interviews beginning at 4:00 pm. Founded by local business owner and veteran, Kelly Terrien, the vision of Showered With Love is to provide a sense of dignity and hope to those experiencing homelessness by offering access to a safe toilet and shower facility with clean water, soap, and a towel. The nonprofit is currently partnering with The Salvation Army who will store the unit at their 709 South Sierra Madre Shelter and Services at RJ Montgomery. The two agencies plan to actively collaborate and explore outreach opportunities and partnerships with churches, businesses and other social service providers to operate and provide services via the mobile shower. The unit will also be available to provide mobile hygiene for emergency disaster services if needed. Showered with Love is actively seeking sponsorships and donations in support of its current fundraising goal of $150,000. Funds will support operations of the current three unit trailer, and go to purchase a second eight unit trailer that will allow SWL to provide services on a full time basis. For more information about Showered With Love, or to make a donation visit www.ShoweredWithLove.org. NOTE: A ribbon cutting and dedication ceremony will be held with city officials Thursday, August 30th 12:30pm – 1:30pm at The Salvation Army Shelter and Services at 709 South Sierra Madre – Media invited to attend. You make a donation using a PayPal account or a credit/debit card to PayPal Giving Fund (a 501(c)(3) charitable organization). * If, after reasonable efforts, PayPal Giving Fund cannot deliver donations to this charity, the funds may be donated to another charity per PayPal Giving Fund’s policies. Our Android and iOS apps make it easy to fundraise on-the-go.